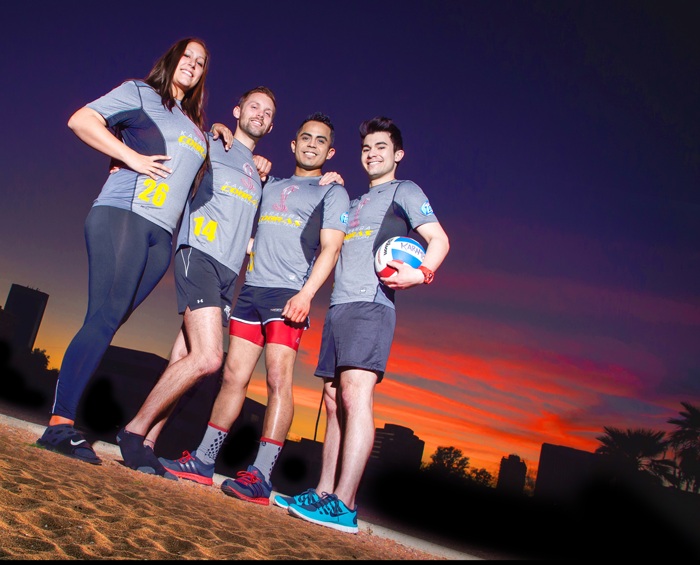 Just before summertime temps start to “spike,” Arizona Gay Volleyball Association (AZGV) prepares to host its annual “Sets On The Sand” tournament at Steele Indian School Park in the heart of beautiful downtown Phoenix. The popular sand volleyball tournament is open to anyone 18-years-old and up who’s looking for some competition. Ladies, this is co-ed! Show the dudes what you’ve got! Approximately ten-to-twenty competing teams come from Arizona as well as California and Nevada and anywhere from 44-to-120 athletes are expected to compete in the tournament. The four-man tournament has a six-man roster limit and the fun all happens during Memorial Day Weekend. Everyone meets on Friday, May 22 for the Opening Pool Party at the host hotel, the Wyndham Garden Phoenix Midtown. This is a great opportunity to get acquainted with the other players poolside with DJ Urban at the turntables. The real fun starts on Saturday, May 23 when everyone meets at Steele Indian School Park at 9 a.m. for Pool Play. Roscoe’s On 7th is the place to be for the Seeding Party. Things start in earnest on Sunday at 9 a.m. for the tournament, and after the dust settles, prizes and trophies are awarded. A special closing party will be held nearby at Stacy’s @ Melrose, a popular dance club and bar. There is a tournament team registration fee of $120 due by May 8. Book your room at the Wyndham Garden Phoenix Midtown, 3600 N. 2nd Ave. in Phoenix. Call 602-604-4900 and mention AZ Gay Volleyball for special rates. Monday, June 2 is open play while competitive play starts Monday, June 9. For more information and to register visit AZGV.org and “like” us on Facebook, search #AZGVORG.